As Li Na ended her campaign in France to become Asia's first Grand Slam singles winner, another battle commenced at home. Li Yanping, the new champion's mother, was on a trip to her uncle's native county of Xinhua in Hunan province on Saturday when the final began in Paris. When she arrived, reporters, tennis fans and local officials were waiting. National television repeatedly showed scenes of cheering crowds around Li Yanping with red banners proclaiming, "Come on, sister Na, a good daughter of Xinhua". was born and raised in Wuhan, capital of Hubei province. People there felt that their thunder had been stolen. Wuhan's mayor, Tang Liangzhi, did make the first official call to congratulate Li Na, saying her success "brought honor to the people at home". But that gesture, residents of Wuhan said online, is no match for what Xinhua did to "make it look like sister Na's hometown". Disputes over bragging rights to celebrities are nothing new in China. They usually involve well-known historic figures, not 29-year-old athletes, and some have festered for centuries. Now, however, big money is at stake - tourism money - not just pride. A case in point is that of Zhuge Liang, a famous statesman during the Three Kingdoms period (AD 220-280). He likely would be surprised to be an incentive for economic growth in places where he was born, lived or worked. But here he is, at the center of a battle among one county and two cities that claim to be his hometown. Yinan county in Shandong province has invested 1.5 billion yuan ($231 million) since July in a project that includes Zhuge Park, covering more than 50,000 square meters, plus statues, Han-style buildings and five kilometers of roads. The county, which says that Zhuge (AD 181-234) spent his childhood in Yinan, held a ceremony on May 16 to celebrate the completion of the park. Nanyang, in Henan province, and Xiangyang, in Hubei province, also have spent huge sums to build or rebuild structures to prove their claims as Zhuge's hometown. Just two days before the Yinan ceremony, city authorities in Lianyungang, Jiangsu province, decided to spend 4 billion yuan to build a theme park, Journey to the West, because they believe that Sun Wukong, the Monkey King, was born there. The construction is scheduled to begin in July and operation in 2013. Qianshan, Lujiang and Nanling counties in Anhui province are wrestling to be hometowns of the Qiao sisters, two beauties in the Three Kingdoms period. At least five regions have claimed to be the hometown of Li Bai (AD 701-762), China's greatest poet of romanticism, since he died. The fight still isn't over and the central government jumped into the fray last year. Experts said such projects aim to develop tourism and enhance local economies, which makes sense. Proceeding with projects without thorough research does not. "Very often, local governments add modern elements into the construction of so-called cultural heritage sites," said Cui Yong, a researcher with the China Academy of Cultural Heritage in Beijing. "However, cultural buildings should not be copied until the area has a rooted cultural heritage. People don't want to see replicated 'antiques' during sightseeing." The idea of rebuilding Zhuge's birthplace occurred to the local government in 2005, said Zheng Bin, director of Yinan's tourism bureau. Yinan sponsored an exhibition to promote its products and tourism in Seoul, and South Korean officials were impressed when they learned Yinan was Zhuge Liang's birthplace, Zheng said. According to The History of the Three Kingdoms, written by Chen Shou in the Western Jin Dynasty (AD 265-316), Zhuge was born in Zhuanbu township of Yinan county. He left at the age of 14 with his uncle for what is now Jiangxi province. "Historical celebrities are an essential element for cultural landscape tourism," said Deng Hui, director of the Tourism Management Department at South-Central University for Nationalities in Wuhan. He said they are particularly important to remote or underdeveloped areas that are new to tourism. Yinan's GDP increased 18 percent last year to 14 billion yuan, but still ranked eighth among the 12 districts and counties in Linyi city. That makes tourism, and the yuan it will bring, particularly important. Xue Jie, deputy director of the Yinan publicity department, said tourism contributed about 2 billion yuan to the county's GDP last year, up 230 percent from 2009. "Though the industry still has to be perfected, the effect has already been shown to us," he said. "I'd say there's no year when and no place where Li Bai wasn't born. . . . (Li was) as much from Baxi (in western Sichuan province) as he was from Longxi (in Gansu province), Shandong, Kuaiji (in southern Jiangsu and northern Zhejiang provinces), Xunyang (in Jiangxi province) and Yelang (in Hunan province). "(Li's) glories are found in where he died, lived, was exiled and imprisoned. And in places where he neither traveled to, was being held at, lived in exile in nor went to, those glories are found in the people who read his work and thereby carry his spirit. Don't fight!" Li Zhi wrote. Five centuries on, economic incentives lead the concerns as local officials mobilize historians, alleged descendants and media outlets; name museums, parks and schools; and map out plans for luxury hotels and holiday resorts. 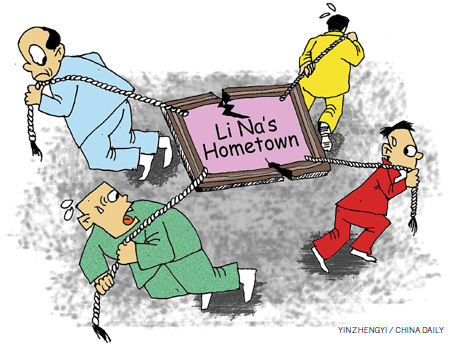 Tension escalated in August 2009, when China Central Television 4 began to air a promotional ad that read, "Welcome to Anlu, the hometown of Li Bai," three times a day. That enraged officials and residents of Jiangyou, a county in Sichuan province where the poet was widely believed to have been born and raised. For decades, it has been selling what it calls "Li Bai culture" to promote its image. In a rare move, tourism officials in Jiangyou wrote to the Anlu government and CCTV, asking the channel to pull the ad because it infringed on their rights as people from the poet's "true hometown". Anlu, in response, said it hoped to share the title - "hometown of Li Bai" - with Jiangyou. And when CCTV suspended the ad broadcasts, Anlu's officials consulted the State Administration for Industry and Commerce on whether the ad amounted to a rights infringement. The administration replied that "as a place where Li Bai had lived for a long time", it was "reasonable" for Anlu to claim itself "the hometown of Li Bai". Officials in Jiangyou responded furiously with threats to file lawsuits. Things cooled off only after the central government stepped in last year to halt all disputes concerning claims over hometowns of historic figures anywhere in the country. At the time, national headlines were filled with three provinces' fight to claim Cao Cao, a warlord in Zhuge's day whose tomb was allegedly found in a Henan village. County officials started to sell tickets to the site - a freshly built exhibition hall with very few artifacts - while archaeologists were still disputing the evidence. This is why the central government took action. The Ministry of Culture and the State Administration of Cultural Heritage last July jointly issued a notice, saying that any publicity on controversial and unidentified historical figures' hometowns would not be allowed. Local authorities are prohibited to name hometowns of any historical figures. The ministries also said that monitoring should increase to prevent excessive commercial development and any deliberate distortions and abuses of cultural heritage connotation. The top leadership's direct intervention brought a temporary end to smear campaigns and hate mail between counties and towns. But within their jurisdictions, most of the promotional campaigns have continued.